Restore Your Skin and Feel Renewed at Rexults medSpa! You are here:Home » Promotion / Events » Restore Your Skin and Feel Renewed at Rexults medSpa! With technological advances in skincare in this age and time, there’s no excuse not to look good – as long as you invest in your Skin Health and Well Being. You may recall that I have been on the GLAM-GLOW program at Rexults medSpa, and on my recent visit to the posh holistic wellness medSpa, located at #17-02 Tong Building ( beside Paragon ) in Orchard Road, I was introduced to their 90-minute Restorative Radiance Face Therapy ( SGD 300 ). I must say that this is the ideal treatment to prepare you for an important event. It is everything you would expect in a bespoke face therapy - a great reparative fix for any skin! What you will receive in this full face therapy is an intensive restoration. A special delivery system activates deep infusion of the therapeutic-grade mask and serums. The ' High Touch ' deeply relaxing face massage combines the High Tech to give you the absolute face therapy experience. This therapy repairs and restores skin for the glamour event - bringing back tone and luminosity. Definitely great for tired, lacklustre skin that needs to look red carpet ready. So, if you think your skin deserves a rejuvenating treat, I give my thumbs up to this anti-ageing face therapy that produces effective and visible results! What I also like is the fact that Rexults medSpa Talents take the time to understand your lifestyle and needs, and thereafter they fully explain the aim and the benefits of the therapy. It is wise to be educated on the benefits of key ingredients as well as the state-of-the-art technology that will do wonders for your skin. In this manner, I found the consultation to be leaning towards the innovative and scientific, not just about beauty but Skin Health - definitely more than mere aesthetics. Do you have days when you feel rather sluggish and that you need some bodywork to tune yourself up? I am a firm believer that a great massage is about the skills of the therapist, and Rexults medSpa Talents certainly do not fall short in that department. In fact, I was amazed by the ‘ healing touch ’ of my therapist who provided me with the 60-minute Rexults Intuitive Massage ( SGD 180 ). SGD 210 Restorative Radiance ( Usual Price: SGD 300 ) 90 mins. SGD 100 Rexults Intuitive Massage ( Usual Price: SGD 180 ) 60 mins. • Price quoted includes GST. • Valid only for new customers and one-time purchase only from now until end August 2015. • Appointment / booking is required. Rexults medSpa is located at 302 Orchard Road #17-02 Tong Building ( Beside Paragon ). Call +65 6738 0988, or email: info@rexultsmedspa.com. In addition, Luxury Haven is most 8delighted to collaborate with Rexults medSpa, hosting a giveaway where winners will be able to experience bespoke treatments in this luxurious wellness medSpa. 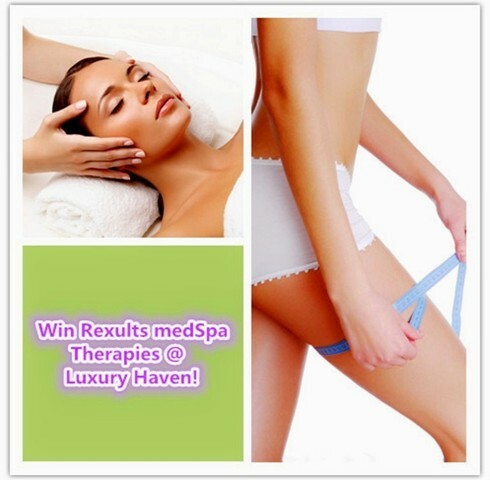 Hop over to Giveaway: Win Rexults medSpa Luxury Face and Body Therapies now! This is surely some indulgence! You must have felt super relax. Great treatment, I need it!!!! This mask looks so great! Thank you for your visit!!! I follow you by bloglovin too!!! Oh that sounds super relax Shirley. Beautiful skin you have. That looks so relaxing! I could use a massage right about now! You look so peaceful in this pic Shirley. This treatment sounds so wonderfully relaxing! This looks so soothing, Shirley, and you look so lovely and relaxed. You have beautiful skin, too! during summer I really need this sort of treatment. This seems like a great way to restore our skin. The treatment itself seems very relaxing and it is additional plus that the staff there is willing to take time to understand one's lifestyle and needs and offer advice accordingly. I must say your skin look radiant and absolutely beautiful. Wonderful shots! The massage seems like a fantastic experience. I'm a bit advocate of massage, I believe it is very healthy as it can not only improve circulation but improve our muscle tones. A good massage is like exercise and sleep all in one- it makes us feel rested but it also helps to get us in shape. What is there not to love? The treatment did wonders to your skin Shirley. Anyway your skin has always been good. This treatment sounds wonderful, Shirley and you look beautiful, girl. I would loved to get such an amazing treatment (thinking of moving to your place ;) Happy start into a new week, Shirley. What a treat for the skin! I am sure most women would love to go for this. You look great! Anything that improves blood circulation is good in my book! Your skin looks incredible, Shirley! I am so jealous of your glowing skin. Spa treatments in singapore is quite awesome, I will try this place during my next visit. Great place darling! Amazing experience!! How come I missed this post? Hmm.. I'm visiting your blog like a late comer hihi, wish I could subscribe to your blog so I'll get the email notification once you have a new post, sadly I can't find a subscription box. But that sub box seems like playing hide-and-seek with me.. I'll just pay a visit more often to check out your new post. Hi Shirley! pampering like a Queen. I heard about this treatment. it sure does make a different to skin. Massage... this I need today.